Jim Sanders is a descendant of Francis Sanders, brother of the Reverend Moses Sanders. In his research, he has worked extensively with the original documents and land records, especially in Montgomery County, North Carolina, the ancestral Saunders/Sanders home. Many of his contributions have appeared elsewhere on the Internet, but this site is the first to make available to the public a booklet he wrote in 2004 and recently revised for publication here. Copies of the documentation and maps that were in the original booklet are also provided at the end of the article. 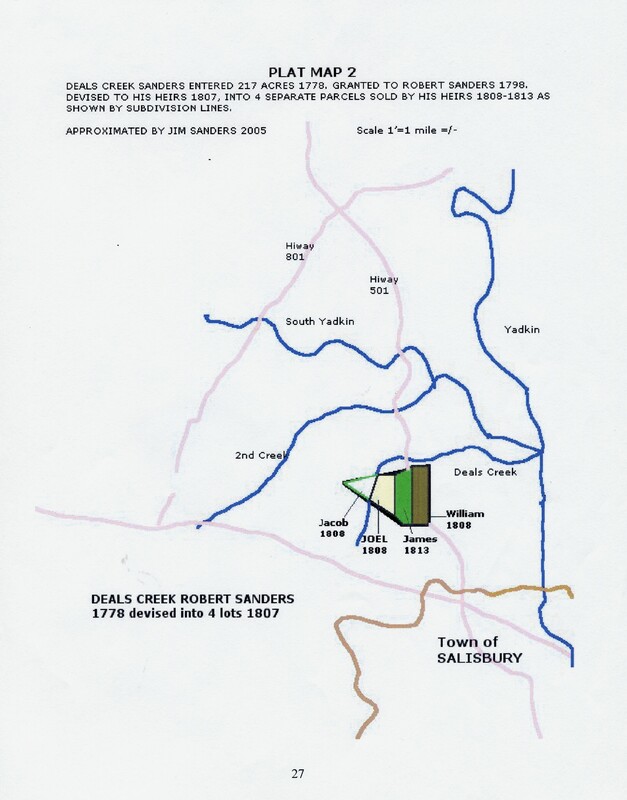 An extensive review of all known warrants, deeds and patents recorded for Anson/Montgomery County, NC, gives us an accurate view of the land holdings of the Sanders families who lived on or near Barnes Creek between 1770 and 1810. Recorded land documents concerning Sanders families have been reviewed and a possible connection of three branches of the Sanders clan will be shown. Barnes Creek is east of the Pee Dee River, South of the Randolph County line and in the Uwharrie Watershed. The Barnes Creek is not a single watercourse, but a creek with numerous branches, only a few of which are named. 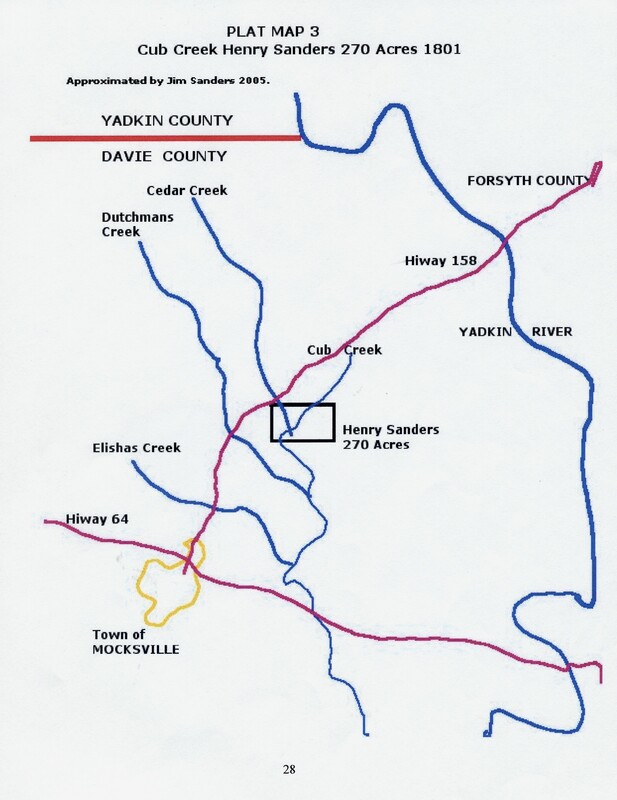 The Reedy Branch, Abner's Fork (or Creek) and the Dark Fork are three that are mentioned in Sanders’ Land Grants that have not been located. Barnes Creek flows into the Uwharrie about 4 miles above its conflux with the Pee Dee. It originates in the mountains and hills of northern Montgomery and southern Randolph Counties. It flows, generally, southerly and westerly into the Uwharrie. The Uwharrie River joins the Yadkin, west of Troy, North Carolina. From this point south the Yadkin is called the Pee Dee. Duncomb's Creek flows southerly between the Barnes Creek and the Uwharrie. It actually joins the Uwharrie about 1.5 miles northwest of the Barnes Creek. Notations of two related families, the Steeds and Hamiltons, are included for reference and connections have been made between these families and our line. Many documents have been located and over 2500 individual recordings have been reviewed. Even with this pointed research we cannot make completely accurate assessments of the relationships of the many Sanders we have found. It will require further study from many other sources. Among these sources, but not limited to them, are bible records, court records, original family correspondence and family tradition. When all available information is processed one may make more reasonable assumptions to the relationships. DNA testing has supported some of our findings. We would encourage all Sanders family members, interested in their lineage, to be tested. We may never know the true relationships of our Sanders forbearers but we will continue to search. “SIEMPER FRATRES”. As stated before many land documents have been reviewed showing a Sanders family member as a grantee or grantor or they may be referenced in the body of other documents. They may be chain carriers or their property mentioned as a boundary point, but their names are there. Most frequently and as was commonly done, neighbors and adjacent property owners assisted with surveys as chain carriers. This assistance was not only neighborly; it was necessary, if one was to ensure the surveyor accomplished his duty correctly. We have tried to assimilate this information into a concise form. However we will acknowledge that sometimes it is not easy to follow the direction these documents have taken us. We continue to review all available research material and will make adjustments as needed. Thank you, Josephine Sparks and Elden Hurst, for their valuable research and willingness to share. A very special thanks to Gary Sanders, whose clear mind and sound judgment has been relied upon many times in the preparation of this work. The first grouping of Sanders we have located were in South-Eastern Anson County in what is now Richmond County. We believe this is the line of a noted Sanders researcher, Jo Sparks. 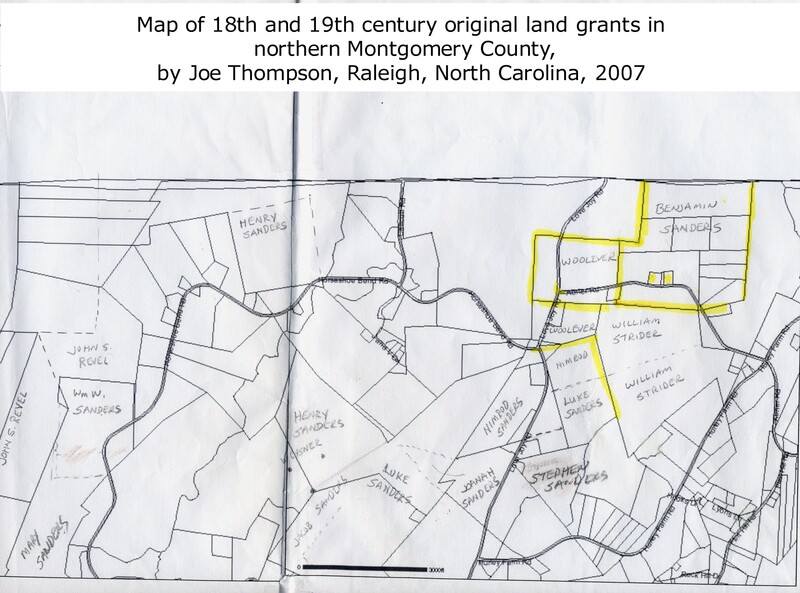 Recently (2008) we have been following a clue that may tie this line to Halifax County, VA.
A James Sanders received his first deed in 1761 for property on Mountain Creek. It was adjacent to Patrick. Their properties, we believe, are located just South of the Montgomery County line in Richmond County, formed in 1779). Patrick and James Sanders was signatory to the “The Regulators Petition” of Anson County in 1769, as were other Sanders from Anson County. They were protesting for relief of unfair taxation, without representation. Two other Sanders men are listed from Anson on the roster of men who served in the Battle of Alamance, which was the breakup of the Regulators, David and Thomas E. We do not find any other records of these 2 men in our search of the records of Montgomery and Anson. At this time we wonder why we do not find any of the Barnes Creek Sanders signatory to the Regulators list. Perhaps they were not yet living in North Carolina. 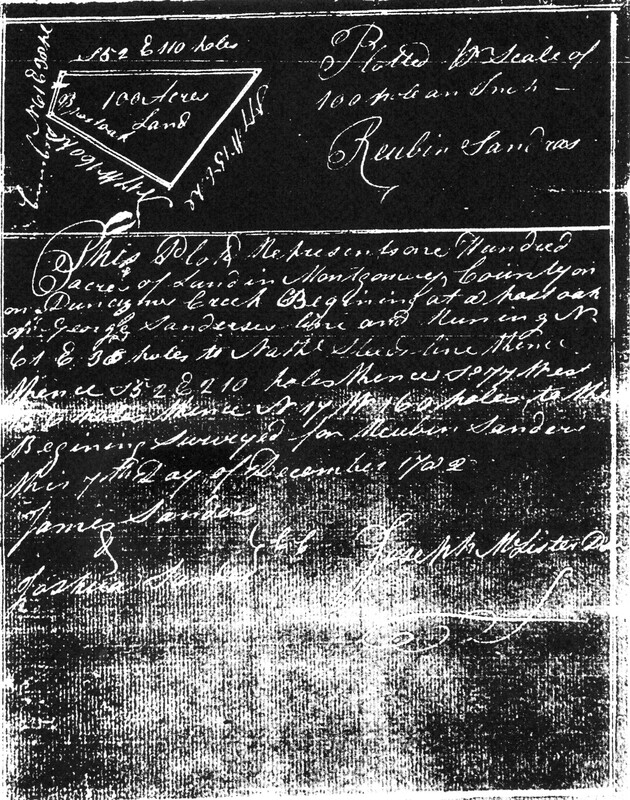 Patrick Sanders last land transaction in Anson County was in 1779. We find him on the 1782 tax list of Rutherford Co. NC (Formed from Tryon in 1779, which was formed from Mecklenburg in 1768) The next entry we find for Patrick is in Spartanburg, SC 1800. In the 1800 census he is listed living next door to his sons (?) William and Patrick Jr. He died between 1800 and 1810, we believe in Spartanburg. William, Nathaniel and James Sanders are shown on various deeds to be from the Cheraw’s District, Craven County, South Carolina. These deeds date from 1757 through 1784. (Family History Library (LDS) films #0018271 and #0018145). 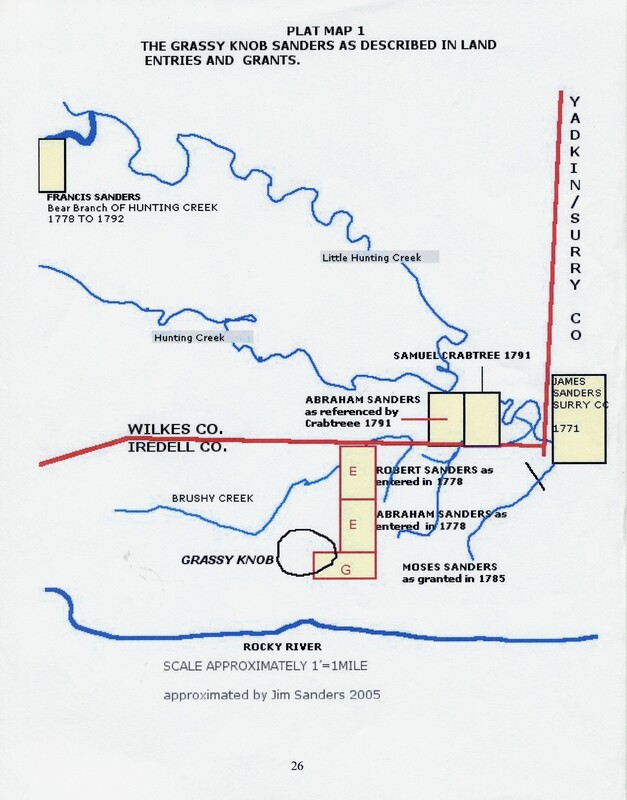 William Sanders first acquired property in Anson in 1757 on the Woody Branch of Rocky Creek. He is listed as being from the Camden, South Carolina, district in 1784. Nathaniel acquired a grant in 1766 on Buffalo Creek near Little River. They were very active in Anson and Bladen Counties, notably on the Waccamaw, Gum Swamp, and Shoeheel in Anson prior to 1784. 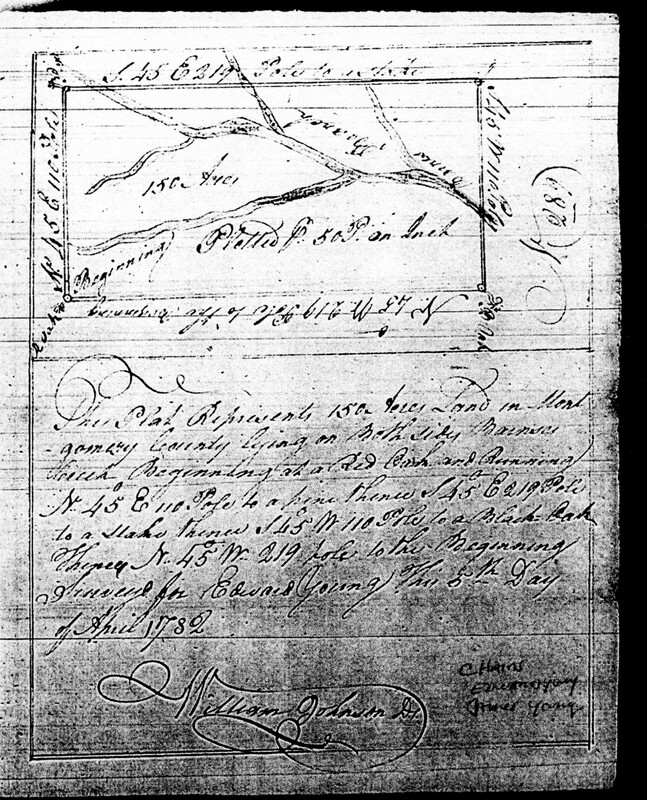 A William Sanders is shown on many records as receiving several pieces of land on the Rocky River, in Montgomery County in the 1780’s.Elias Butler used Jeffery Sanders as a Chain Carrier on his survey for his property on Rocky Creek in 1785. We believe that Jeffery was a member of this Family group. 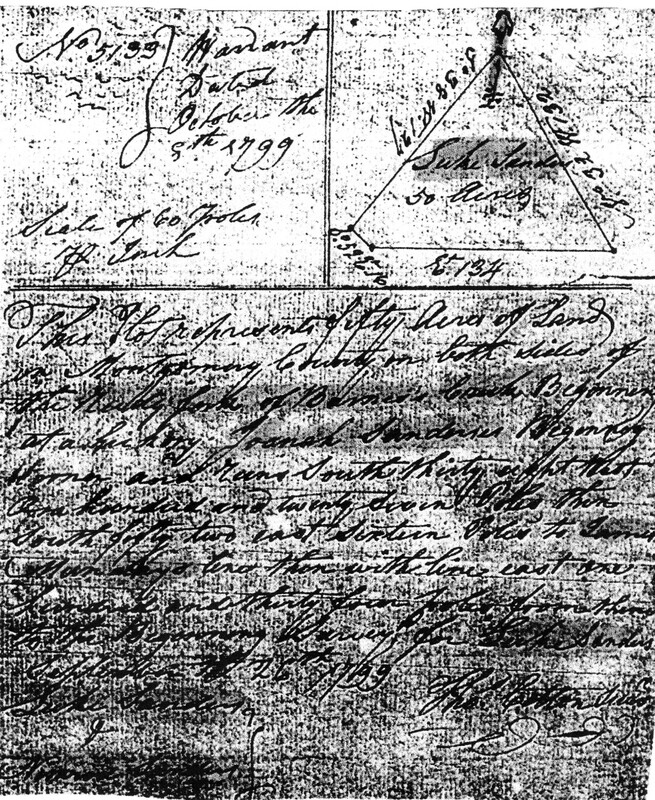 There is a possible connection of this group to the Barnes Creek Sanders through Elias Butler. 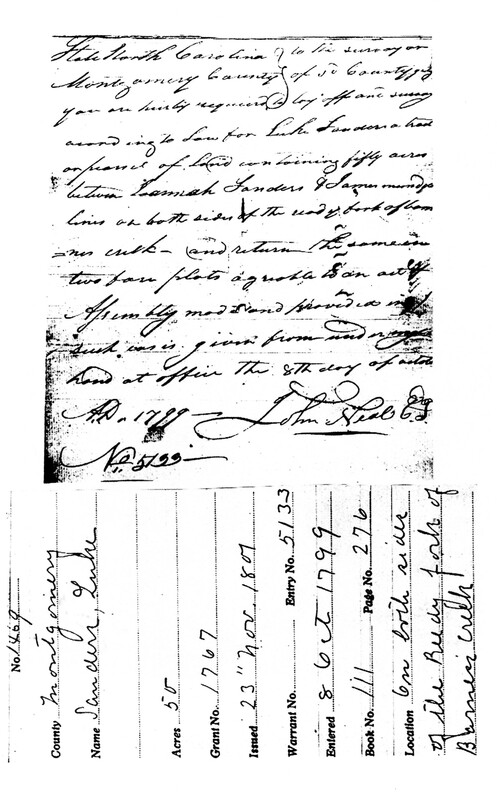 In 1779 he Elias entered a warrant for a grant on Barnes Creek Referencing the “Widow Sanders” line. Elias also had a piece of property adjacent to Jacob, Luke and Joanah Sanders on Barnes Creek. When Elias surveyed that particular piece of property in 1785, He used Aron and Stephen Sanders as chain carriers. The conclusions, regarding the relationships, are evasive and the writer will leave the opportunity for discovery to the reader. This family group may well start with John Sanders in South Carolina. He had two sons, George and Thomas. “George was the father of Nathaniel Saunders, who became a man of some means”. ("A History of Marion County, South Carolina", 1902, page 142, by W. W. Sellers, Esq. 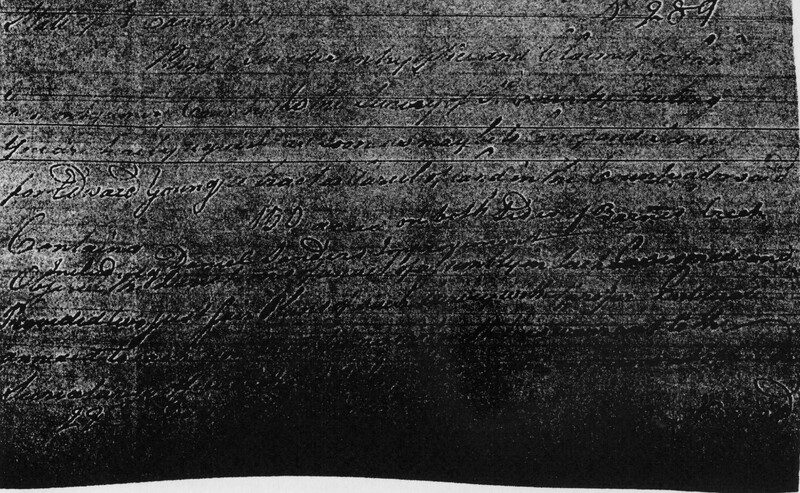 Montgomery County NC, extant deeds 1774-1842. A Deed from William Hill to Lewis Morgan was proved by the oaths of John Kerby and William Sanders. We are presently reviewing additional records of Halifax. As stated in 2004 above, Patrick received his first property in Anson in 1758. The location of his patent was very near William Sanders property, who buys the land from Morgan Brown, a surveyor, on November 27th 1757 on the Woody’s Branch of Rocky Fork, Anson County. William was said to be a Carpenter. 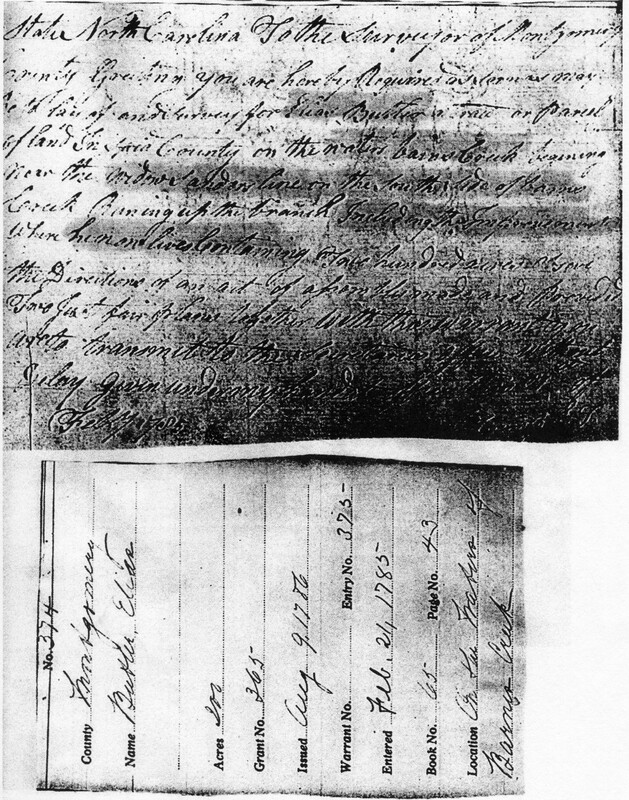 DNA testing of a descendant of James Sanders of Anson, Montgomery, and Rutherford Counties reveals that James, and presumably Patrick and William of Anson, belongs to the same Sanders line as the four brothers who appear in Anson and Montgomery in the 1770s and 1780s: William Aaron, Moses, Isaac, and Francis. Further documentation about the brothers will be given elsewhere in this paper. At the present time, we have no way of knowing whether James was also a brother or another type of relative. Montgomery County was formed from Anson in 1779. 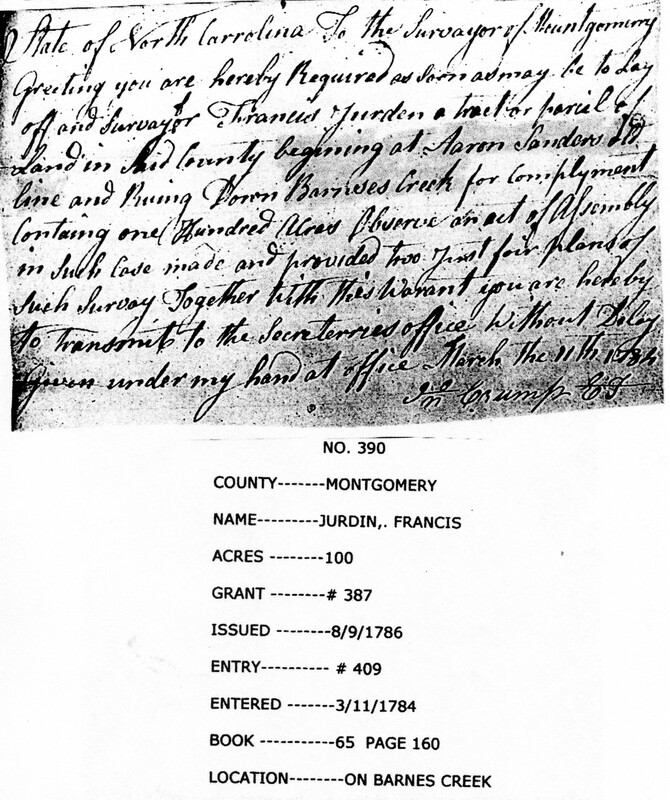 The earliest records of Montgomery County are found as Land Entries. When the County was formed from Anson County in 1779, property owners were instructed to “enter their holdings” at the county office. These “Land Entries” were not only used as documentation for all property owners it was also used as a basis for taxation. Within these lists we find numerous citations of our Sanders family. 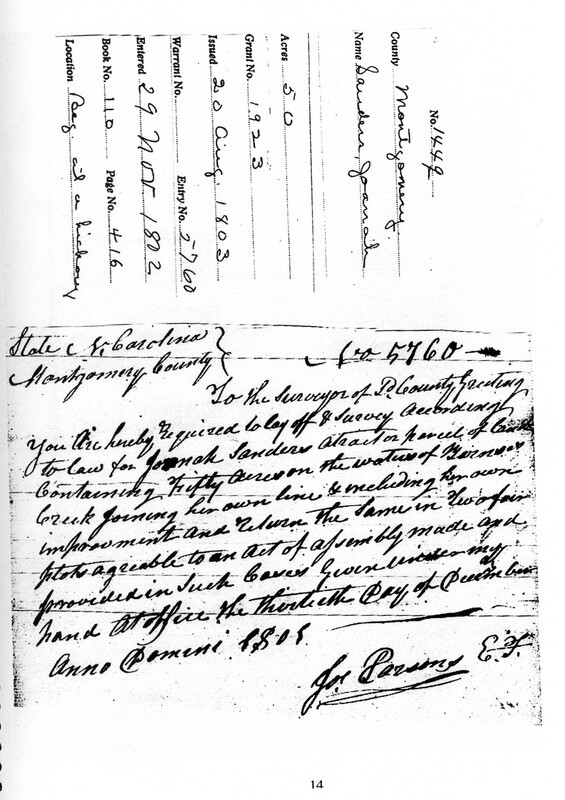 Prior to the formation of Montgomery County, Land Warrants or Patents were issued through the Provincial Government and recorded in Anson County. Fortunately the legal descriptions contained in these documents are tied into streams or rivers. It is from these records and their descriptions that we are able to determine the approximate location of our family holdings. By date of acquisition and proximity to each other we can make assumptions as to relationships. In doing this one must consider the work of others. The lines of communication between researchers are open and will continue to be so. 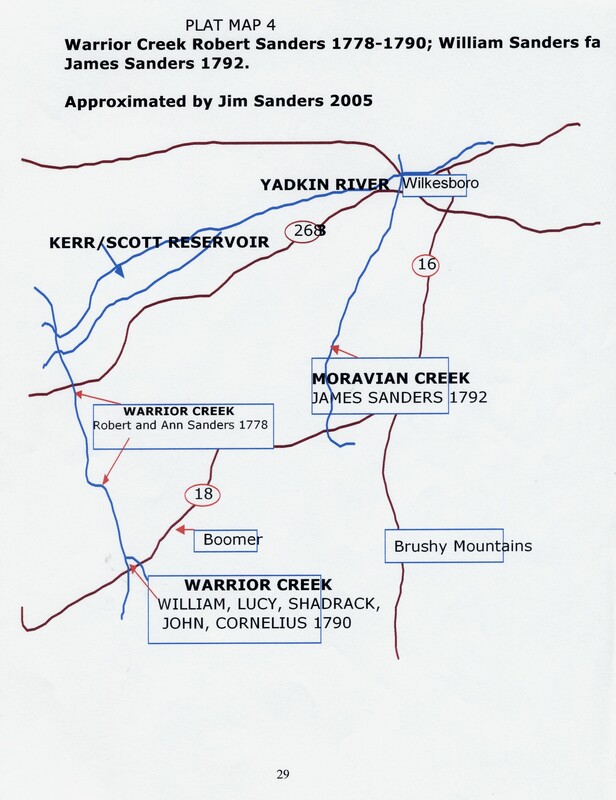 The first of our family’s holdings on Barnes Creek and its’ tributaries were issued to Moses Sanders, Aaron Sanders and George Sanders beginning in 1771. We will call them the first generation. Moses and Aaron are brothers and we believe that George may also be a brother, or cousin, although the evidence is scant. We have not found documentation that provides proof of this, but the dates and proximity of the grants leads us to this conclusion. (The name George appears in the William and James Sanders line from SC). There may be other first generation Sanders and we believe Francis, Daniel and Isaac are the others. They are all certainly related and we suspect they may be brothers. Moses Sanders family has been well documented by Elden Hurst and we’ll summarize some of his work here: Mose’s wife was Mary Hamilton Sanders. They had 5 sons: Aaron (1769 VA); Moses Jr. (1771 NC); David (1775 NC); Amos (1781 NC); John (1787 NC) and two daughters: Sarah 1773 (NC); Nancy (1778 NC). Moses was one of the more aggressive Sanders in accumulating property. As early as 1771, Moses had received several grants of land in Montgomery, then Anson County. The locations of these grants were noted as 640 acres, South West of the Pee Dee, on Old Mill Creek. Another was for 100 acres on the west side of the Uwharrie (Chain carriers were Arthur Adkins and William King). Another for 200 acres on Duncomb's Creek and is cited as being adjacent to Nathaniel Steed. The Steeds; John Sr. and sons Nathaniel, Moses, Mark and John Jr., in the 1760’s, are found in Brunswick County, VA, as neighbors to Joseph Hamilton, Mary Hamilton Sanders father. William Hamilton, (Mary Hamilton’s brother) and Moses and were closely aligned for more than 50 years and received adjoining land Grants in Anson. We believe the families left Brunswick, together, bound for Anson in the early 1770’s. 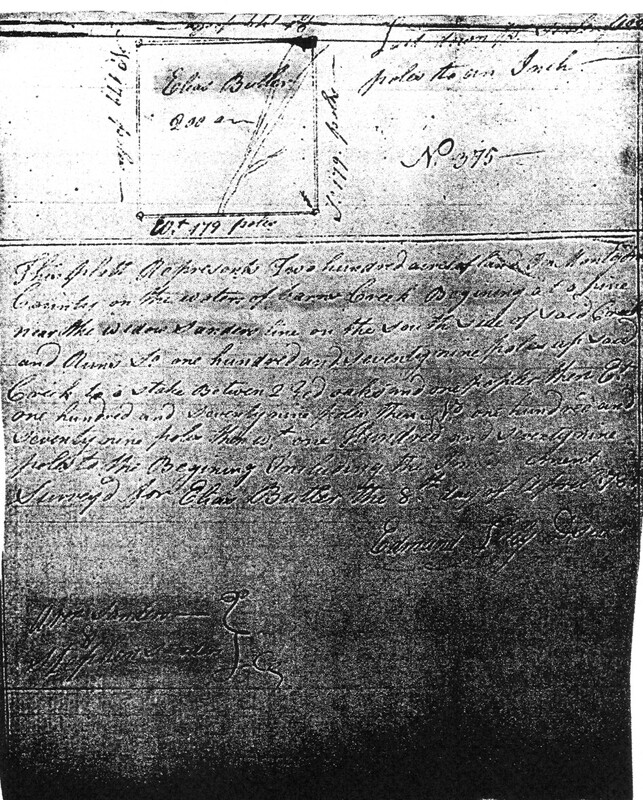 In 1796, Joseph Carnes received a warrant and survey for 100 acres. The beginning point for the survey was a White Oak on Moses Sanders line. Carnes was a neighbor of the Sanders family. 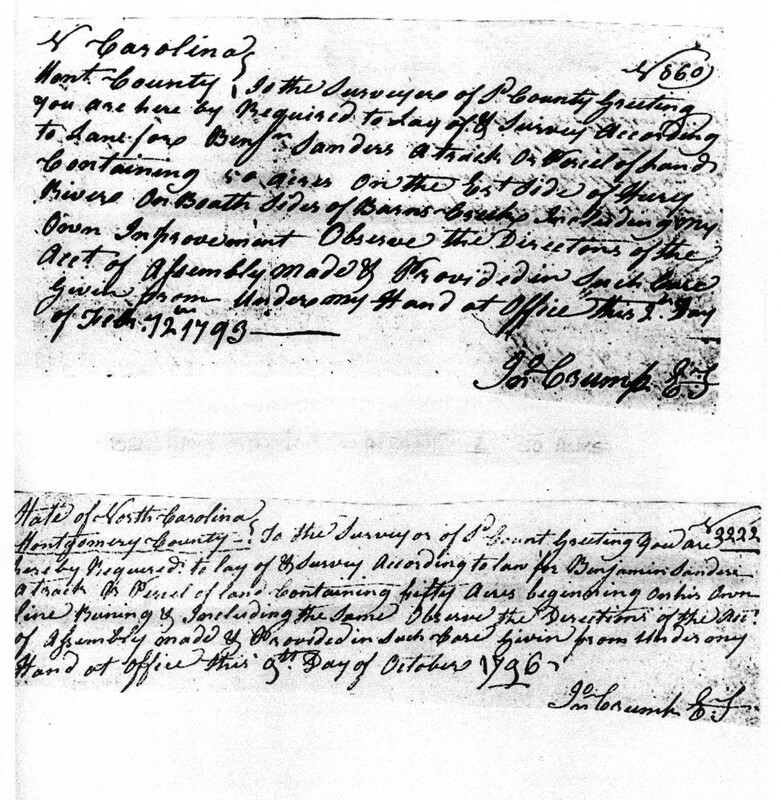 The warrant for the survey was based on a 1779 entry in the Montgomery County entry book of Benjamin Baird. This discovery has two benefits, 1) It is probably the home parcel of Moses as it would put him in close proximity to Aaron in 1779 and 2) the chain carriers were noted as Luke Sanders and Walter Hamilton. This provides more proof that the Hamilton family is closely intertwined with the Sanders family. Moses left Montgomery in 1782 For Wilkes County. He was taxed in 1782, 1784 and 1785 in Wilkes County. In 1785 he bought a piece of property from Obediah Baker on the Grassy Knob. He is referenced many times in the court records of Rowan and Iredell counties during the years 1786 through 1791. He was a justice of he peace, road overseer and constable. In April of 1785 a Moses was noted as being a chain carrier on a survey for Francis Jordon, for property located next to Joanah, William Aaron’s wife. We believe that this Moses was the son of James, whose line has been well researched by Jo Sanders Sparks. An Aron Sanders was also noted as a chain carrier in a 1785 survey for Elias Butler for property adjacent to Luke and Joanah Sanders. Moses (the Reverend) filed a lawsuit in 1789 in Rowan County Courts. Apparently George Kirk had Moses arrested for taking property from him. Kirk was a neighbor on Duncomb’s Creek. 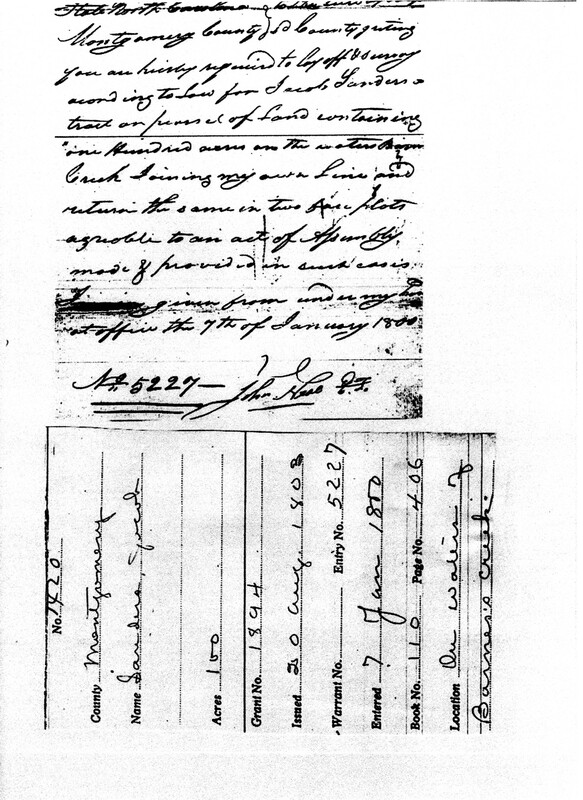 Court records of Rowan County displayed that Moses stated that he had been taken from his home, by Kirk and several armed men and ordered to sign a mortgage to Kirk for forty dollars. Moses admitted he signed the note but denied he owed any money to Kirk and Kirk now had possession of Moses’ property (in 1789). A review of subsequent records does not show a disposition of this case. Moses inferred that Kirk had accused him of being in concert with the “Tories”. This bit of information and another family history legend that Aaron was killed by “Tories” and also that Francis had not signed the “Oath of Allegiance”, gives a glimpse into what the “atmosphere” might have been like in Montgomery County during the war. This may lead one to believe that perhaps there may have been some perceived British sentiment in the Sanders family during the war for Independence. 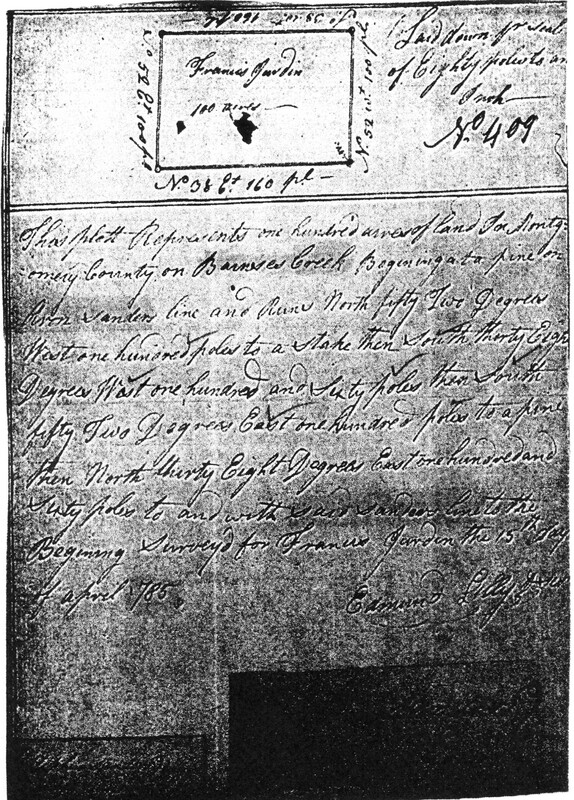 Moses may have owned at least one more property on Barnes Creek, as Edward Young referenced him as an adjacent property owner in his survey of 1782. We have not been able to locate this parcel. We now believe that Abner's Creek is a fork of Barnes Creek. 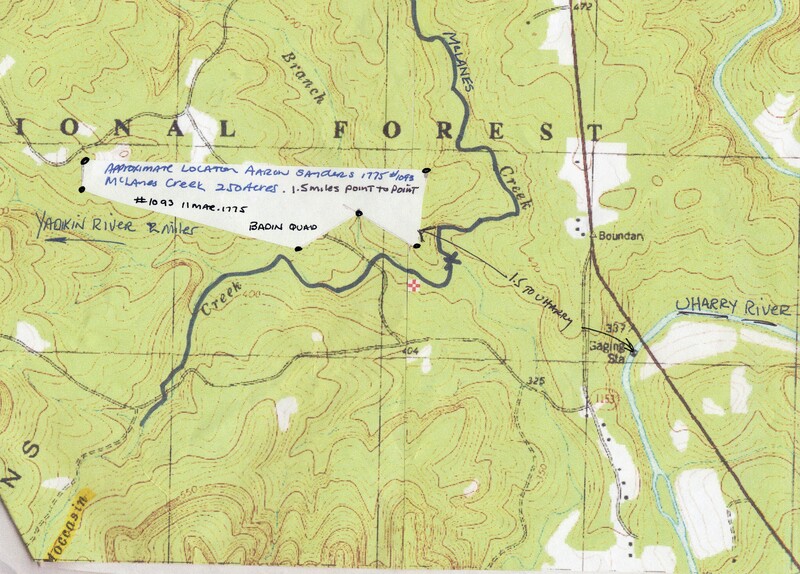 This Fork of Barnes is shown on the topo maps near Abner and Abner’s Mountain. William Aaron Sanders’ family has been well documented by the work of Gary Sanders and others. We have recently discovered (2004), that Moses Sanders’ brother Aaron, and the William Aaron Sanders noted in the Thomas Bailey Sanders’ letter, were one and the same. Our conclusion is supported and based on a couple of discoveries. One was that Aaron Sanders was issued a land Grant on May 24, 1773. It was described as “…on the Reedy Fork on Barnes Creek”. We’ve reviewed the original Grant. Nimrod Sanders, William Aaron’s son, in 1836, sold this tract of land to William Strider. The legal descriptions of both transactions are the same. Another important discovery was Survey “tie-ins”. On two different surveys the same corner “tie-in” is referenced. In the 1785 Elias Butler Survey, the “Widow Sanders” line is noted and is the same bearing and distance on Barnes Creek as in a survey for John Crump in 1794. Aaron’s wife would have been known as the “Widow Sanders”. Aaron Sanders was killed during the war in 1781, some say by Tories. His estate was administered in Montgomery County in 1782. We have not viewed that record. Of the first generation Sanders, Moses and William Aaron are the most frequently mentioned in the records. In 1774 they, along with George Sanders and William Hamilton) were ordered to construct a road from Beaver Dam Creek to Rocky Creek. Beaver Dam Creek is now under Lake Badin and Rocky Creek is Anson County. In 1775 Moses was a Justice of the Peace in Montgomery and Aaron was appointed as a Constable in Moses’ room. Aaron, Moses and George Sanders were holders of land grants on Barnes Creek. George’s grant has not been viewed but Aaron and Moses received their grants on Barnes and Abner Creeks, respectively, in 1773. Their properties were surveyed on the same day, June 27th, 1773. At first glance we assumed we had found a new Sanders. However, after reading the warrant for the survey, closely, we discovered “Joanah” is noted as a Her. The warrant also stated the survey was to include “Her improvement”. The legal description indicates that this property is a part of the original grant to Aaron Sanders in 1773. 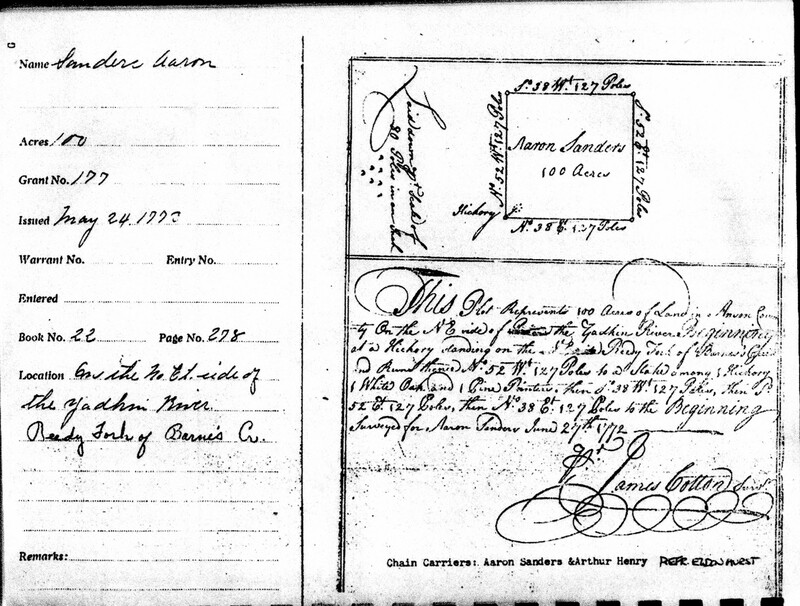 Aaron’s wife, referred to as the “widow Sanders” in subsequent land documents, remained with her family on Aaron’s grant land on Barnes Creek until her death. The latest reference to her is in 1811, and Nimrod seems to have remained on the property where his mother had lived until he sold his land in the 1830s and moved to Alabama. According to tradition among his descendants, his brothers were Stephen and Luke, both of whom owned land contiguous to that of Nimrod and their mother. Another Sanders relative, Jacob, also lived adjacent to her and is discussed later in this work. Further documentation about the family of William Aaron and his brothers is available at the Web site of Gary Sanders. George was issued a Grant in May of 1773 on Duncomb’s Creek. Both Moses Sanders and George Sanders properties are referenced as being adjacent to Nathaniel Steed. In a warrant to Joseph Carnes dated 1790 the description also notes it adjacent to George Kirk. The warrant states that Carnes is to have 200 acres on Duncomb’s Creek below George Sanders running towards the County line (north). Joining Sanders line and Steeds line. This again puts George in the proximity of Moses. He was ordered to help build the road from Beaverdam Creek to Rocky Creek as was Moses, Aaron and others in 1774. George may have had 3 sons James, Joshua and Rueben and may be a first generation Sanders. 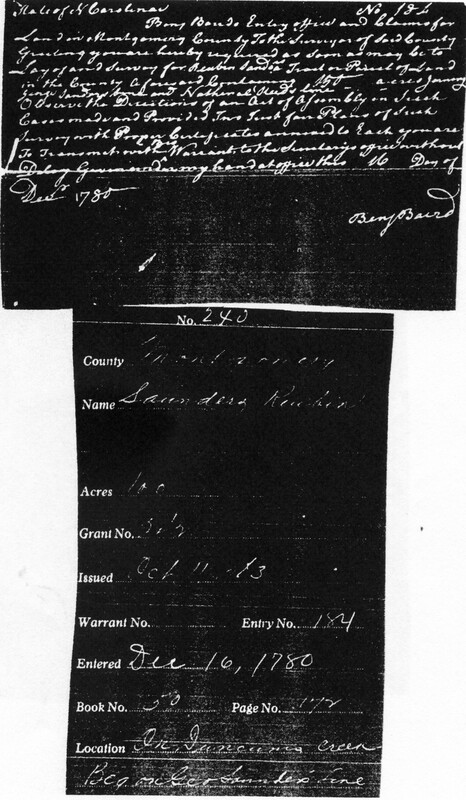 Rueben Sanders was issued a grant entered as #184, Grant # 242 issued 11 October 1783. It was for 100 Acres of land on “Duncuns” Creek. His Grant uses George Sanders’ line as a neighboring reference point. George Sanders Grant was dated 1773. Rueben’s was 1783. He is very likely his son. The Chain Carriers for Rueben’s Grant were: James Sanders and Joshua Sanders. Perhaps these two men were either Reuben’s’ brothers or his sons. Or possibly they were sons of another first generation Sanders. 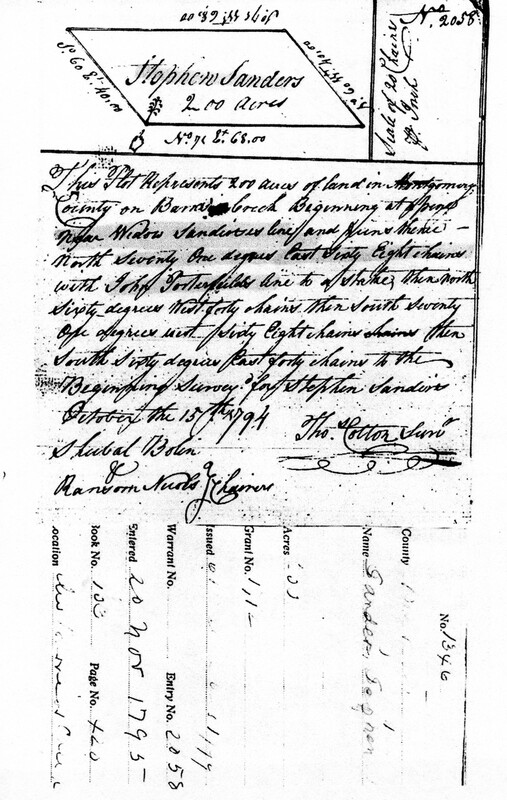 Two different Joshua Sanders are listed in the 1790 Census of Montgomery as are two different James Sanders. Rueben would be a second generation Sanders. (Francis is probably this researcher’s GGGGGrandfather). Moses Martin Sanders, a grandson of The Reverend Moses Sanders, while completing his Vicarious Ordinance Work, at the Temple in St. George, Utah, in 1778, noted that the Reverend Moses Sanders (Groves Level Church, Franklin County, GA 1802) had a brother, named Francis (Reference Elden Hurst). Jos. Thompson Jr. referenced a “F. 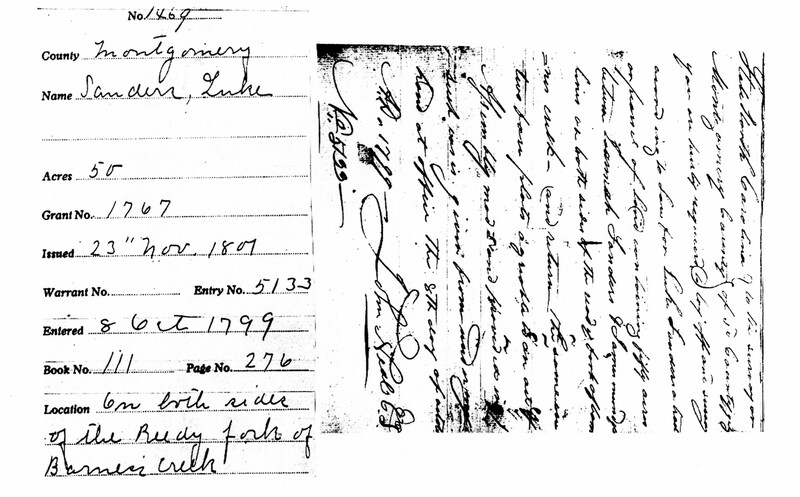 Saunders”, in a Deed for property on the “Middle Fork of Lick Creek, the Waters of Jones Creek”. (Although this property is about 20 miles south of the Barnes Creek area we mention it as a reference for future study). Mathew Bailey was also mentioned as a neighbor of Jos. Thompson. We know that Aaron Sanders’ wife was a Bailey. Another transcribed entry was viewed on the Internet that referenced a John Sanders in 1778 on the Lick Fork of Jones Creek. It is possibly that F. Saunders and John Sanders of Lick Creek are the same man and he could be there Francis Sanders researched herein. In 1777 Francis Sanders is noted in the court records of Rowan as one who had not taken the “Oath of Allegiance”. This “Oath” was a pledge required of all men in our fledgling country. If one did not take “take the Oath he may be considered a “Tory”. We do not know if Francis ever took the Oath. 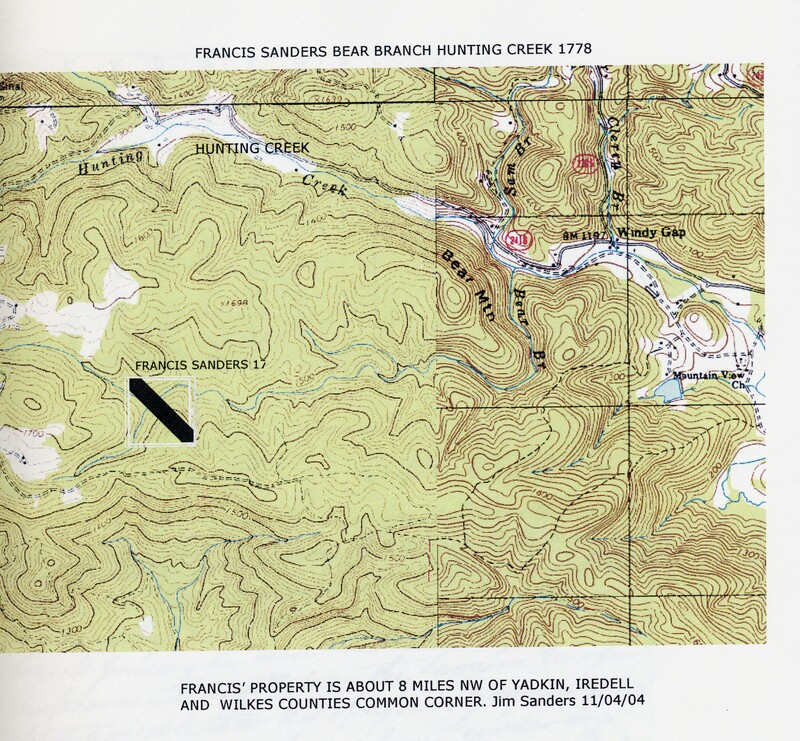 We are reasonably certain that our first generation Francis received a land Grant in 1778 for 100 acres on the Bear Branch of Hunting Creek in Wilkes NC. A Francis also received a warrant for 150 acres on Cabin Creek in then Rowan County, now Davidson County. 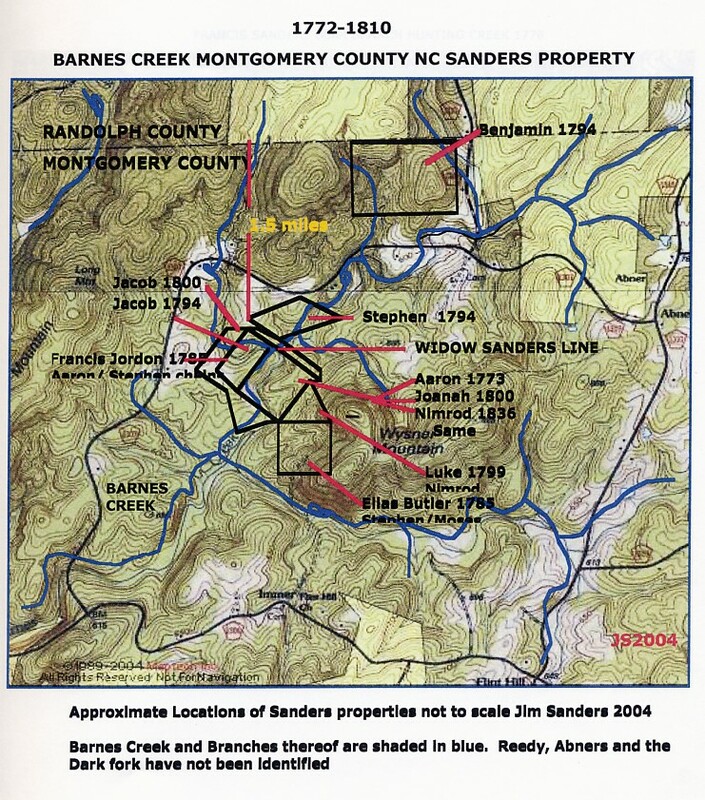 This latter location is about 10 miles northwest of the Barnes Creek area of Sanders Families. We know that Francis is on the Wilkes County Tax List of 1782 through 1790. 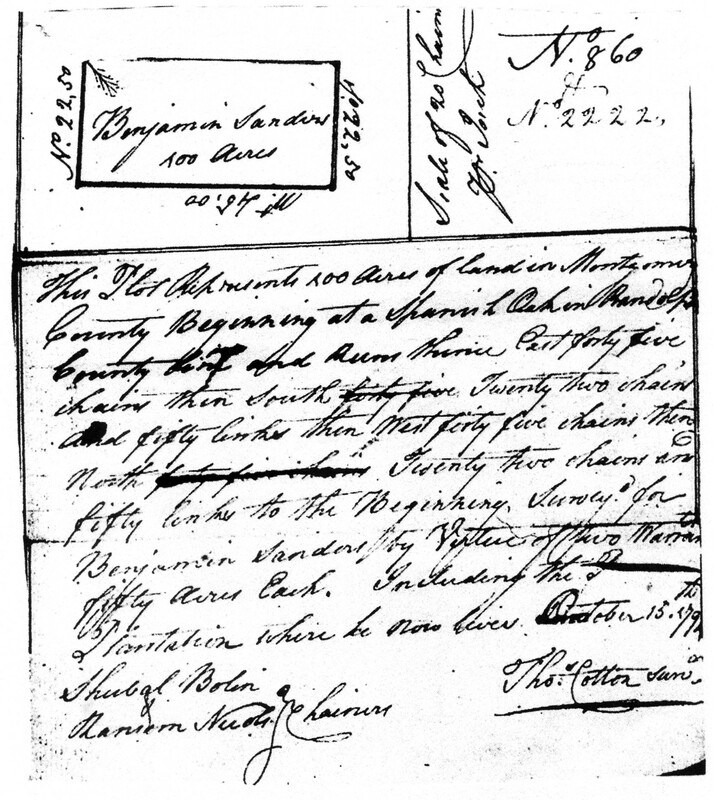 In March 1792, he sold his property on the Bear Branch for 40 lbs. to Benjamin Crabtree. The Montgomery and Rowan County citations of Francis are entered here as reference material for further research. Other possibilities may exist. Francis was a first generation Sanders. One Sanders that has been elusive and may be related to the first generation is Daniel. On 6 March 1779 Edward Young entered Warrant # 289 for 150 acres of land. The land was described as lying on both sides of Barnes Creek. Included in the warrant for this land is the statement that the improvement of Daniel Sanders was to be included. This of course, would indicate that Daniel Sanders had once; either owed the land or “squatted” and built a cabin or other improvement on it prior to 1779. 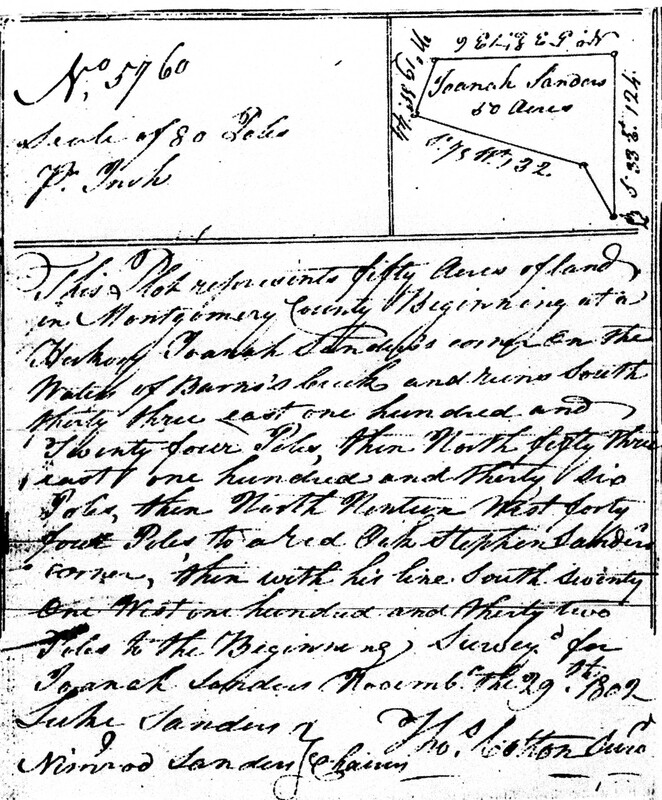 This Edward Young, in Entry #290, March 6th, 1779 also referenced that Moses Sanders was an adjoining property owner. This would indicate that Moses and Daniel were close neighbors.A Daniel Sanders is listed on the 1759 and 1755 Rowan County tax list but no other record has been found of him. This Daniel, if he were the same Daniel as the Barnes Creek Daniel, would be older than the first generation brothers. He could have been a progenitor of the Sanders Family of Barnes Creek. 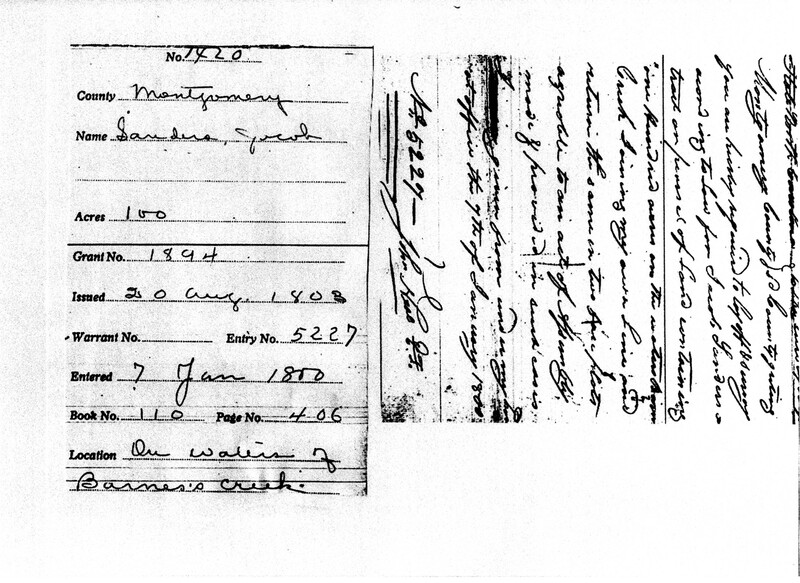 Our search of the records of Montgomery County through 1810 reveals only one mention of Isaac. He is on the tax list of 1782 showing him owning 200 acres, with one cow and a horse. Without viewing this grant we cannot determine the proximity of Isaac to the Barnes Creek Sanders’. Isaac is listed in the Hillsboro District of Randolph County in 1800. Thomas Bailey Saunders of Texas wrote in a letter in about 1890 in which he referred to three brothers in Montgomery County NC, “William Aaron”, “Isaac”, and "another brother, named Moses”, who was a Baptist preacher." Isaac is probably this brother and would bring the number of Sanders brothers to five. An Isaac Sanders is indexed in Franklin County, GA along with Moses and Francis in 1803. He had no property there but paid a poll tax. He was not listed subsequently in GA. The name Isaac Sanders is found several times in the records of Maury, Bedford and Franklin County, TN and has been researched extensively in Alabama and Mississippi, still we cannot definitely connect these Isaac’s with Isaac of Montgomery County, NC. He is possibly the youngest son of William Aaron. Nimrod stayed on Aaron’s grant land was enumerated in the 1800 Census of Montgomery County. He is the only male in the family and is listed as aged between 16 and 25. A female is listed as over 45, born before 1755. I submit that this is Joanah or the “Widow Sanders”. They are living on the property on the Reedy Fork of Barnes Creek. By 1810 Nimrods family has grown. He has a wife and 2 sons under 10 and 2 daughters also under 10. His mother is still with him and she is shown as being born before 1765. In 1836 Nimrod sold the grant land to William Strider. as they all, at different times, were listed as owners of the same property). Nimrod received a parcel of 100 acres on January 5th 1806. The Grant number 2001 was for land on the waters of Barnes Creek. Issued 14 November 1804. Entry 5784. Book 116 Pg. 436. Card 1672. This transaction has not been reviewed. Nimrod is a second generation Sanders. Jacob is first noted as a reference in 1794 in a grant to John Crump. His property is noted along three courses of Crump’s land and then ties into “Aron” Sanders old corner. This was an important discovery as the tie into Aron’s corner is the same corner “tie-in” that is referenced in a Grant to Elias Butler in 1785. 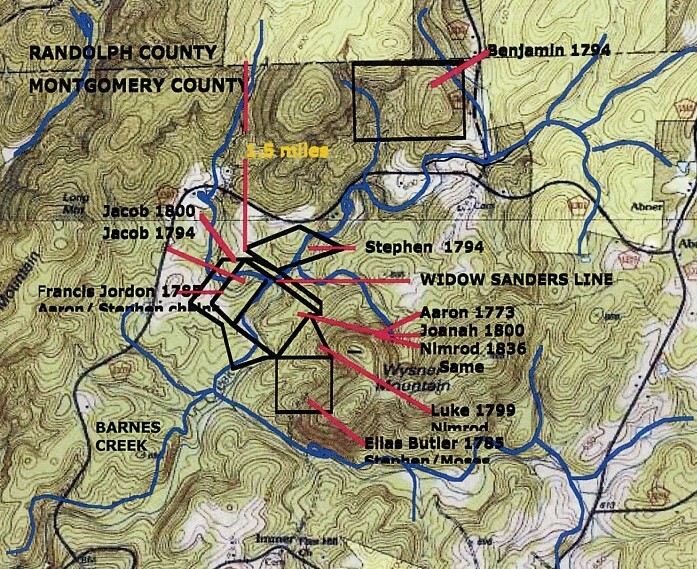 In the 1785 Butler Grant, the “Widow Sanders” line is noted and is the same bearing and distance on Barnes Creek as in Crump’s grant. This is more evidence to corroborate our belief that “Aaron” and “William Aaron” are the same person. Jacob was a neighbor to the west of Nimrod and Joanah. 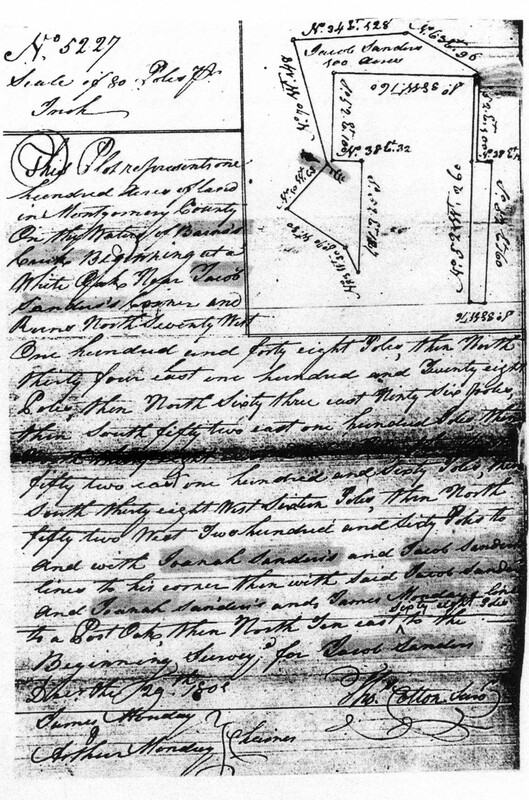 Jacob Sanders Property was surveyed for him 7 January 1800. Grant 1894. It was for 100 acres on the “Waters of Barnes Creek”. Issued 20 August 1803. Book 110 Pg. 406. Card 1420. Evidently he was already living on the property prior to the issuance of the grant. Jacob was also noted as a Chain Carrier with James Neal for Neal’s survey in 1798. It was for 300 acres near William Hamilton’s corner on the north side of Barnes Creek. (William Hamilton was Moses Sanders Brother-in-law and a neighbor of Moses). Jacob Sanders is listed in the 1790 census as being born before 1784; four boys in the family born after 1784; three females. In 1800 his family is listed as Jacob and wife born between 1756/1774; 4 boys born between 1785/1790; 2 boys between 1790/1800; 4 daughters. We could date Jacobs’ birth as between 1757 and 1773. Jacob is a second generation Sanders. Much more information may be found, on Jacob, at Gary Sanders Website. We believed that the Aron Sanders, noted as a Chain Carrier, on a grant to Elias Butler in April 1785, was a son of the Reverend Sanders. Then we discovered that Moses moved to Wilkes County in 1782. At 13 years of age, Aron would have moved with his father. We thought how he could be in two places at once. When properties adjacent to the deceased William Aaron Sanders were to be sold, Joanah, his wife, was living on the property. (William Aaron’s original land grant was issued in 1773 and the land was surveyed on the same day as Moses’, June 27th, 1772. In 1773 Aaron and Moses and others were noted on the same road order. When Aron’s name appeared as a Chain Carrier in 1785 we knew we were dealing with another Aaron. The second Chain Carrier on the 1785 Elias Butler survey was Stephen Sanders. We believe may be a cousin or Brother to Aron? 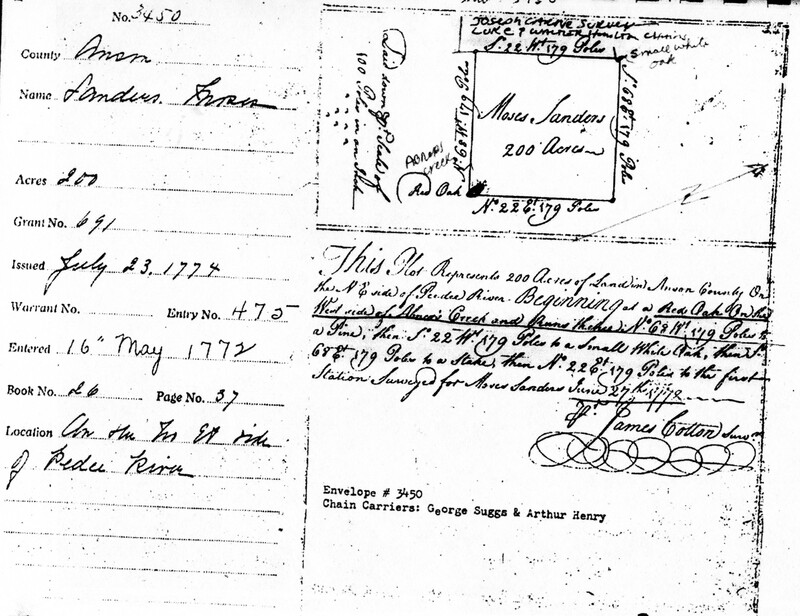 In 1790, Aron (now spelled “Aaron”) was newly married and listed in census of Montgomery County. Reverend Moses son, Aaron, was living next to Moses in 1790, Iredell. We have 2 Aaron’s; one is Moses son, who is the other? 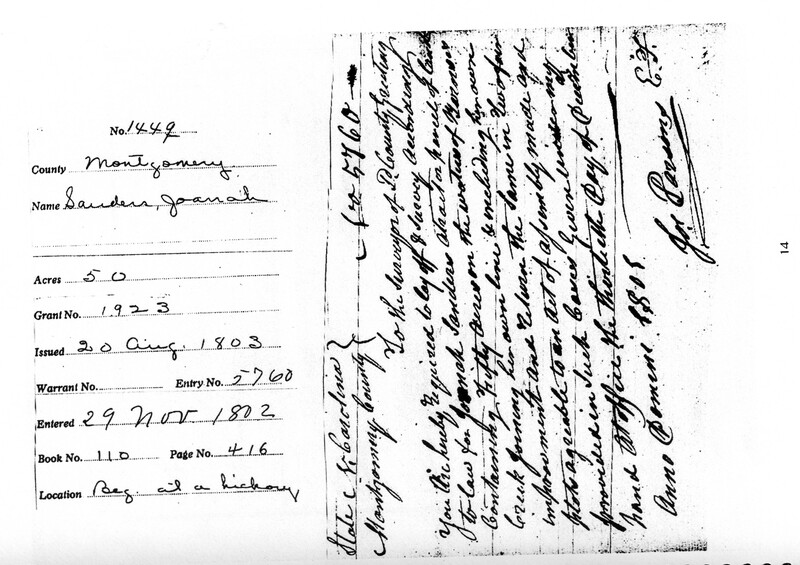 We have reviewed 4 land Grants, which show Stephen Sanders was living on or near Barnes Creek as early as 1785. He was probably a son of Aaron and Joanah Sanders. 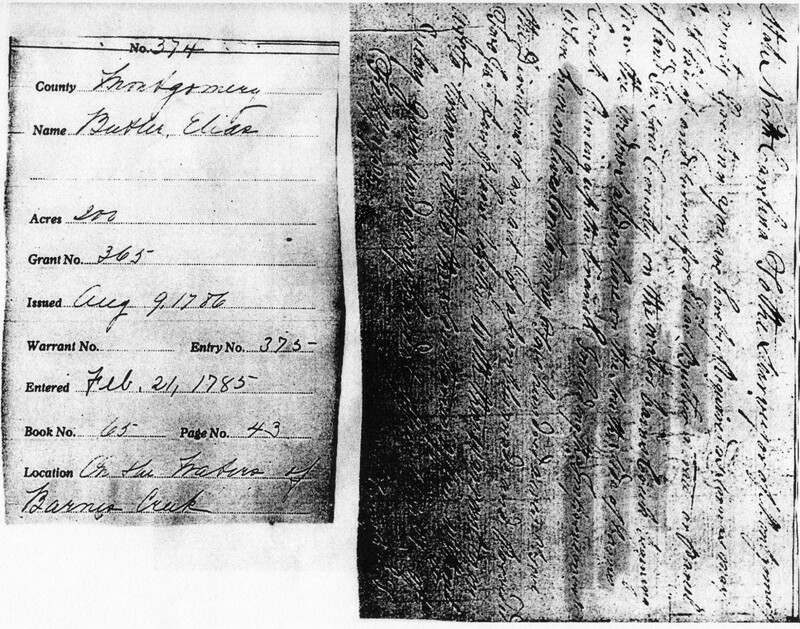 Stephen and “Aron” Sanders were Chain Carriers for the 1785 survey for Elias Butler. The surveyor noted “the “Widow Sanders” line” on the South side of Barnes Creek. Stephen is a young son of the deceased William Aaron. Stephen Sanders is referenced in another Grant to Francis Jordon on 15 April 1785, as a Chain Carrier and the other carrier is Moses Sanders. We believe that this may be the Moses Sanders that Jo Sparks believes is the son of James. We have found a reference to James on Barnes Creek, which is the home parcel of Reverend Moses and William Aaron. We noted that the survey for Jordon’s land was one week after the survey of Elias Butlers. Butler’s land and Jordon’s land are both contiguous to Joanah’s (William Aarons) property. Butler’s survey was adjacent to what is described as “Aaron’s old line”. These two surveys both used Sanders boys as chain carriers. It appears that Jordon’s survey may have been a portion of Aaron’s original grant. In 1794 Stephen Sanders 4th Corner is referenced as a starting point for a survey for John Gray Blount. Stephens’ corner is about 2.5 miles above Densons Fork and on a fork of Barnes Creek. The Randolph County line is due north of this corner, along John Blount’s line, about 1.5 miles. Three-quarters of a mile east of the intersection of the County line and Blount’s intersection, is the beginning corner of Benjamin Sanders Property. The beginning corner of Stephens survey in 1794 is a point on the Widow Sanders (Joanah’s) Line on Barnes Creek. On 30 December 1801 Stephen entered a Grant, 1972, for 50 acres on the waters of Barnes. Issued 19 December 1803. Book 117 Pg. 222. Card 1642. He is a second generation Sanders. Benjamin received one of his several warrants, and probably the first grant, in February 1793. This property is about a mile and a half north of Stephen Sanders land, (which is next to Joanah), and lies on the Montgomery/ Randolph County line. It is described as on both sides of Barnes Creek. Were Stephen and Benjamin brothers, sons of Aaron or perhaps cousins? He acquired more land around his Barnes Creek/Randolph Line in the late 1790’s and early 1800’s and in 1833 sold it all, 300 acres, to John Lucas. Benjamin also had property on Williams Creek, which is about 6 or 8 miles southeast of the Barnes Creek families’ location. He sold this piece in 1795 to Steven Miller. Benjamin is a second generation Sanders. Benjamin Randle received a Grant on I July 1790. The property was on Barnes Creek and James Sanders property was referenced as a starting point in the legal description of the Randle Grant. We would expect this James Sanders to be the same “Chain Carrier James”, noted on Rueben Sanders 1783 survey for property on Barnes Creek. Since two James Sanders are listed in the 1790 Census of Montgomery. We feel one of them is related to our line the other to William Sanders of Rocky Creek. Of course we realize that our guess as to which James is on Barnes Creek and which is on Rocky Creek is just that, a guess. In the family of the Barnes Creek James is a male over 16 (James) with four boys under sixteen and two females. This James is shown in the 1800 census of Montgomery County with four sons born between 1785/90, one son born 1790/1800 and a wife, James is shown as being born between 1756 and 1774. Same guy! James is listed in District 2 of the Montgomery County tax list of 1787. This is the same district as Jeffery Sanders. This district, we believe, is on the Rocky Fork of Little River. 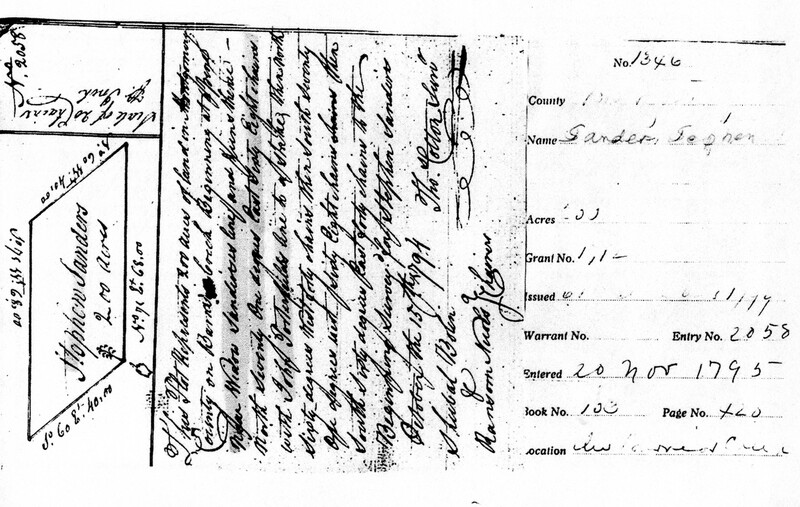 The 1790 census of James Sanders family it shows three men over 16 years of age, two boys under 16 and two females. In 1800 he is in Spartanburg, South Carolina. This would tie Jeffery and this James, into the William Sanders Family. Preliminary research on this family shows them migrating to South Carolina. A recent DNA test on a descendant of James Sanders shows a definite connection to the four brothers, Moses, William Aaron, Francis and Isaac. The first reference to Jesse is as a Chain Carrier for a survey for Little Berry Hicks on Spencer Creek 18 February 1787. Spencer Creek runs north and south parallel and South of Barnes Creek. It flows in the Uwharrie just south of the mouth of Barnes Creek. We would estimate the location of Butler’s survey to be 4 or 5 miles south of the Sanders family’s holding.Jesse may be a second generation Sanders and is probably a son of Jacob. Document 1, 1a, 2, 3, 4, 5, 5a, 6, 7, 7a, 8, 9, 10, 11, 12, 12a, 13, 13a, 14, 15, 16, 17, 18, 19. Map of Montgomery County provided by Jim Sanders. Other graphics from the freeware collection of Cari Buziak.